Recently many home owners have replaced their carpet with hardwood, some people thinking it is a healthier choice.Â Most people are not aware that many studies have been done testing things like the level of in door air pollutants in rooms of hardwood vs carpeted rooms and the findings might surprise you! A study commissioned by the DAAB (the German Allergy and Asthma Society) in 2005 shows that using hard flooring markedly increases the risk of finding an increased fine dust load in indoor rooms, while using (wall-to-wall) carpets minimizes this risk. Â The results of this study were presented to the public in June 2005. Carpet traps particles(dust, pollen, and other allergenic substances) in its fibres, thereby keeping them out of the breathing zone until the carpet's "trapping" qualities are refreshed by efficient vacuuming. Â On a hard surface (ceramic, hardwood, vinyl, etc. ), these particles are constantly swirled up to find themselves in the breathing zone. 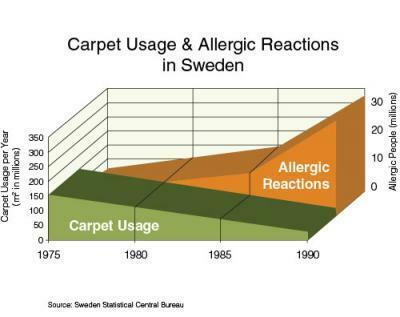 Several other studies have been conducted such as in New Jersey, The Passaic Asthma Reduction Effort study, The Swedish Institute for Fibre Polymer Research study, and The European Community Respiratory Health Service study, all of which found that carpet was actually the healthiest type flooring option. So if you want to breath in less pollutants and especially if you have allergies or asthma consider carpets for your home. When carpet is dirty the home owner looses the benefits of its dust capturing quality and that is why it is important to regularlyÂ vacuum and have the carpets professionally cleaned, so you can take advantage of a healthier indoor environment.